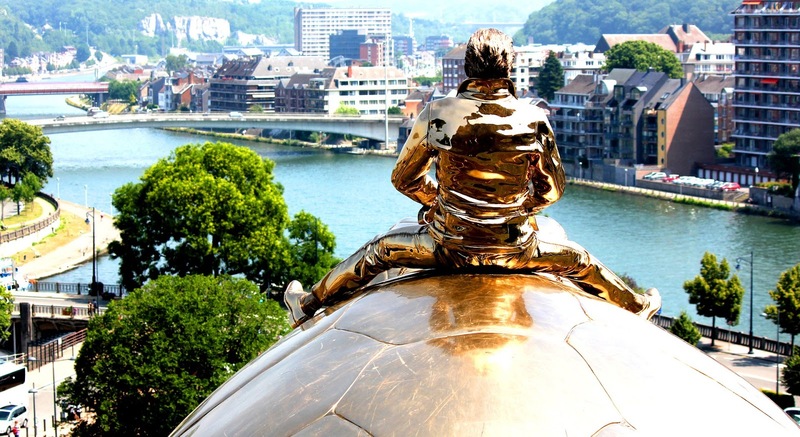 The 'Searching for utopia' artwork of artist Jan Fabre was adopted by the inhabitants of Namur after his ‘Facing Time Rops/Fabre’ exhibition in 2015. The city, some private donors together with a fund raising by the inhabitants of the city, paid 500.000 euros for it. The bronze turtle with an discovering man on its back weighs 6,500 kilograms is seven meters long and five meters wide. It is looking out over the city and ready to take of at any time. Tourists can enjoy it during their visit to the historical Citadel of the city. 'The Turtle', as everyone calls it, has become an attraction, a place for encounters and a strong symbol of the city. The artwork is a original copy of the one that was built in the city of 'Nieuwpoort', at the Belgian coast.